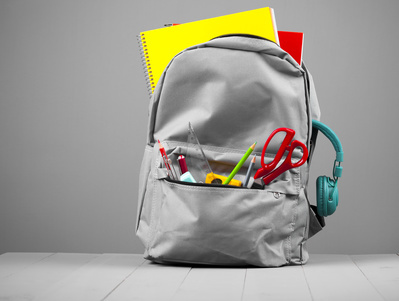 At this time of year, with all the excitement of heading back to school, we want to remind you about backpack safety, specifically, the hazards of a backpack that is too heavy, or one that is ill-fitting. Before you purchase a cool, new backpack for the coming year, whether for your kiddo or even yourself if you’re an adult student, you’ll want to be sure it fits properly and wears well in proportion to your body. A backpack that is too big or too heavy can negatively affect posture, cause shoulder, neck or back pain, sprains or muscle spasms, and even more serious issues like a pinched nerve. In addition, the American Academy of Pediatrics recommends that a child's backpack should weigh no more than 10 to 20 percent of their body weight. Have them hop on the scale, then weigh their loaded backpack separately. Do the math, and make sure you are within these guidelines to protect their growing bodies. Get in the habit of cleaning out backpacks regularly, maybe every Friday after school is over, to get rid of unnecessary items. Also, consider talking to your school about online versions of textbooks that might be available or duplicate copies so that one set can be kept at home and one in the classroom eliminating the cumbersome transport back and forth.